(PhysOrg.com) -- Despite a 30-year lifespan that gives ample time for cells to grow cancerous, a small rodent species called a naked mole rat has never been found with tumors of any kind—and now biologists at the University of Rochester think they know why. 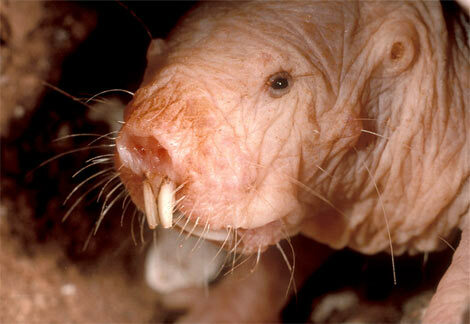 Naked mole rats are strange, ugly, nearly hairless mouse-like creatures that live in underground communities. Unlike any other mammal, these communities consist of queens and workers more reminiscent of bees than rodents. Naked mole rats can live up to 30 years, which is exceptionally long for a small rodent. Despite large numbers of naked mole-rats under observation, there has never been a single recorded case of a mole rat contracting cancer, says Gorbunova. Adding to their mystery is the fact that mole rats appear to age very little until the very end of their lives. Over the last three years, Gorbunova and Andrei Seluanov, professor of bioogy at the University of Rochester, have worked an unusual angle on the quest to understand cancer: Investigating rodents from across the globe to get an idea of the similarities and differences of how varied but closely related species deal with cancer. In 2006, Gorbunova discovered that telomerase—an enzyme that can lengthen the lives of cells, but can also increase the rate of cancer—is highly active in small rodents, but not in large ones. Until Gorbunova and Seluanov's research, the prevailing wisdom had assumed that an animal that lived as long as we humans do needed to suppress telomerase activity to guard against cancer. Telomerase helps cells reproduce, and cancer is essentially runaway cellular reproduction, so an animal living for 70 years has a lot of chances for its cells to mutate into cancer, says Gorbunova. A mouse's life expectancy is shortened by other factors in nature, such as predation, so it was thought the mouse could afford the slim cancer risk to benefit from telomerase's ability to speed healing. While the findings were a surprise, they revealed another question: What about small animals like the common grey squirrel that live for 24 years or more? With telomerase fully active over such a long period, why isn't cancer rampant in these creatures? Gorbunova sought to answer that question, and in 2008 confirmed that small-bodied rodents with long lifespans had evolved a previously unknown anti-cancer mechanism that appears to be different from any anticancer mechanisms employed by humans or other large mammals. At the time she was not able to identify just what the mechanism might be, saying: "We haven't come across this anticancer mechanism before because it doesn't exist in the two species most often used for cancer research: mice and humans. Mice are short-lived and humans are large-bodied. But this mechanism appears to exist only in small, long-lived animals." Now, Gorbunova believes she has found the primary reason these small animals are staying cancer-free, and it appears to be a kind of overcrowding early-warning gene that the naked mole rat expresses in its cells. When Gorbunova and her team began specifically investigating mole rat cells, they were surprised at how difficult it was to grow the cells in the lab for study. The cells simply refused to replicate once a certain number of them occupied a space. Other cells, such as human cells, also cease replication when their populations become too dense, but the mole rat cells were reaching their limit much earlier than other animals' cells. "Since cancer is basically runaway cell replication, we realized that whatever was doing this was probably the same thing that prevented cancer from ever getting started in the mole rats," says Gorbunova. "We believe the additional layer of protection conferred by this two-tiered contact inhibition contributes to the remarkable tumor resistance of the naked mole rat," says Gorbunova in the PNAS paper. Gorbunova and Seluanov are now planning to delve deeper into the mole rat's genetics to see if their cancer resistance might be applicable to humans.